House of the Happy Man: You Can Claim One, Too! If you ever wondered about the Croatian legend known as the House of the Happy Man, doubt no longer. I’ve been there. I’ve seen it. And, more importantly, I picked up a story worth sharing. Recently, as seen in the picture above, I came face-to-face with the actual 15th century stone home known as The House of the Happy Man. 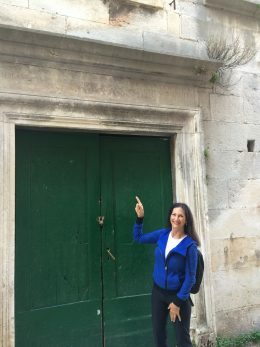 Sequestered in the historic section of Omis, Croatia, the House of the Happy Man continues to stand today as one man’s testimony to gratitude and joy. Had my eagle-eyed husband not spotted a fascinating post in an airline magazine en route to Split, Croatia, I would have missed a trip to this magical seaside haven. More importantly, I would have overlooked what has emerged into a modern day parable worth sharing. If you’re like me, you recall hearing certain fairy tales during childhood that captured your imagination and fueled your passions. One story that captured me was Peter Pan. I never forgot the sense of awe I felt as I viewed an illustration of the fairy-like Peter Pan flying in through the nursery room window of Wendy, John and Michael Darling. More importantly, I was awed by his invitation to the children to fly out with him into Never Never Land. That day, I decided I wanted to go to Never Never Land, too. For me, it represented an ideal state where happiness, youth and vitality were ever present. The darker personalities like Captain Hook in Peter Pan’s story were easily forgotten. But the concept of an extra-dimensional window has always remained in my spirit. Peter Pan’s portal — suggesting we could “fly” with others into higher realms of liberty — always struck me as a possibility. Perhaps Peter Pan fueled my belief in a society that was living happy – from the inside out. My encounter with the House of the Happy Man is a more concrete story that than of the Peter Pan fairytale. It’s worth sharing with anyone on a path to living happier from the inside out. 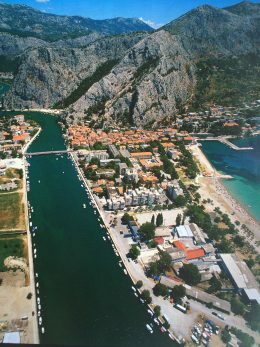 Click here or on the podcast icon below to learn about Omis, Croatia’s House of the Happy Man. Be inspired to create your own happy house, too! Some people’s lives become stories that linger. How much better when the lingering tales are good ones! Oh, how interesting! What a great find – a treasure! Now I want to put an inscription above my door, too. Off to Google this happy man from the past…. I love inspired stories, places and people. Imagine if all of us had inscriptions above our doors that spoke something wonderful about our thoughts, heart and lives? Fabulous tale, Maura! Croatia is definitely on my list of Places I Want To See. Now Omis will be added.